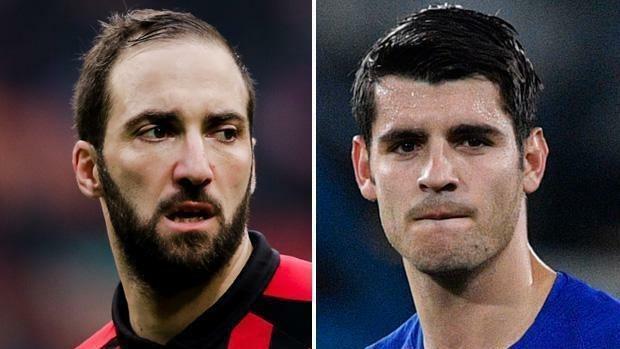 Chelsea are in talks with AC Milan over a potential swap deal between Alvaro Morata and Gonzalo Higuain, according to reports. The Spain striker, 26, has failed to convince Stamford Bridge boss Maurizio Sarri he is the man he needs up top with just four league goals so far this season. Chelsea have long been interested in former Real Madrid man Higuain -with a loan move in January being one option touted. And now Sport Mediaset say that remains a distinct possibility – with the chance of it becoming permanent. They claim 31-year-old Argentina star Higuain, who is on loan from Juventus, could arrive in West London in the new year – so long as Juve agree. Chelsea would then have the option to choose in the summer if they want to make the switch permanent. The other condition of this deal is that Morata goes to Milan for 18 months – but only on loan. A second option being explored is for the pair to both go on six month loan spells. Milan paid Juventus £18million for the season-long loan of Higuain – with a view to a £36m permanent deal in the summer. But the Italian giants now face a fight to balance the books as they struggle to adhere to FFP rules. Morata excelled when previously in Italy. He enjoyed two goal-laden years at Juventus in between stints at Real Madrid – between 2014 and 2016. Former Napoli manager Sarri was keen on landing Higuain last summer but lost out to Milan.